WA TV History is only a forwarding service to a gentleman named Michael Sayre in the US, who handles all the card purchases. We do not get involved in the transactions. All payments are processed through PayPal. You do NOT need to be a PayPal member to make a purchase, though you can. If you prefer, you can pay using a credit card that has been approved by PayPal in your country (most often this is Visa, Mastercard, etc). All transactions are covered by PayPal’s buyer protection. How do I receive the card? Once payment is completed, the code from the card will be sent within seconds via email. There are no long waiting times. The card is not physically sent, only the code is sent via email. What if I haven’t received the email right after payment? Sometimes, emails go to Spam folders, so be sure to check there. Otherwise, sometimes email servers block the emails. If you find you have not received your email in a timely manner, please contact Michael Sayre right away, using the form below, and he will re-send the email to you as soon as possible. My code is not working. What is wrong? 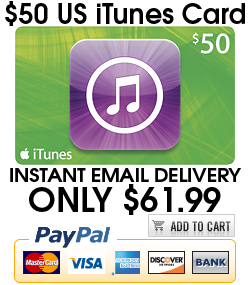 If you are getting an error message from iTunes when you attempt to redeem the code, please contact Michael Sayre right away. Sometimes when they are typed out, there is a small typo that just needs to be fixed. Rest assured everything will be fine. 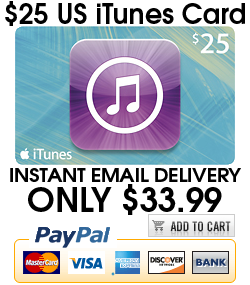 How are you obtaining these iTunes cards? Michael Sayre purchases all the iTunes cards himself, and is the only one who ever deals with them. He lives in the United States and has been selling since 2006. Michael says that the cards are legitimate and in no way fraudulent, like many of the sellers on eBay who live outside the US. Sorry, but all sales are final. Codes cannot be re-issued, so if you are having problems like a credit not showing, and Michael Sayre shows that you have redeemed the code, you will need to contact Apple for further support. I have other questions. How can I contact Michael? Please use the form below to send Michael Sayre an email. He will respond as quickly as possible. However, please remember you are most likely on very different time zones, so he may be asleep!